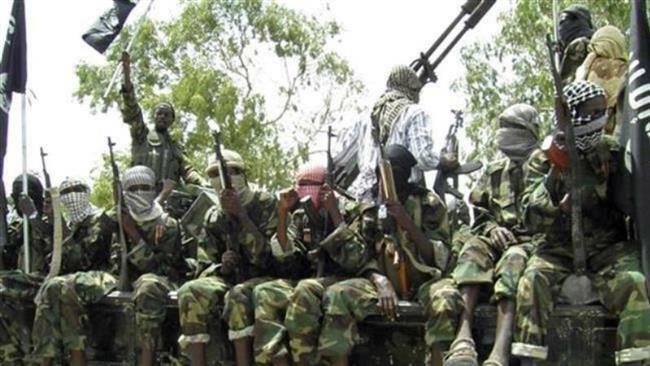 JNN 27 Jan 2015 Abuja : Takfiri Boko Haram terrorists have captured Nigeria’s northeastern town of Monguno after fierce clashes with the West African country’s army, security sources say. “We fought them all night long but they took over the town, including the military barracks there,” a senior Nigerian military officer, speaking on condition of anonymity, said on Sunday. Another military source confirmed that the Terrorists had seized the town, which is located about 137 kilometers (85 miles) from the Borno state capital, Maiduguri. “Our troops had to withdraw after fighting the terrorists for several hours. They came in full force and at the end overpowered our men,” the source said. Earlier in the day, Nigerian forces had repelled attacks by Boko Haram extremists on the nearby cities of Maiduguri and Konduga. Nigerian Defense spokesman Chris Olukolade said a 24-hour curfew had been imposed on Maiduguri following the scuffles. Boko Haram, whose name means “Western education is forbidden,” controls large parts of northeastern Nigeria. It has claimed responsibility for numerous deadly attacks in various parts of Nigeria since 2009. Over 10,000 people have so far been killed in the assaults which have spread out to neighboring Chad and Cameroon. Cameroon launched airstrikes against Boko Haram on December 28 last year after nearly 1,000 Boko Haram Terrorists assaulted a military camp located near the country’s northern border, forcing the Cameroonian troops to flee. The base was retaken by Cameroon military later. Boko Haram Terrorists have launched an assault on the capital of the Borno state, Maiduguri, on Sunday and engaged in fierce fighting with the country’s military. The offensive started just hours before US Secretary of State John Kerry was due to arrive. A fierce battle raged in the city of Maiduguri, capital of restive Borno State, according to the military and local residents. “Troops are repelling a simultaneous attack on Monguno and Maiduguri by terrorists,” a tweet from Nigeria’s defense headquarters stated. Local residents say the fighting between government forces and the Terrorist group is continuing, AFP reports. “We believe hundreds of thousands of civilians are now at grave risk,” Amnesty International said. This entry was posted in AFRICA and tagged Boko Haram, Boko Haram Terrorists, Nigeria. Bookmark the permalink.